The CRT MOTO DB-34 is one of the coolest dirt bikes for kids. With 8.7HP, the DB-34 has plenty of power for any type of ride. Featuring a 4-stroke, air cooled engine, the DB-34 hums along on the ride and doesn’t run hot. The front suspension features hydraulic forks, which gives you better control and helps absorb non-spring weight. With a 4 speed transmission, users can have complete control of their speed to help address the learning process. With a nitrogen air adjustable shock starter in the rear suspension, the DB-34 completes one of the highest quality suspension systems any dirt bike offers. With an easy kick start feature, users can quickly get on their bike on enjoy the ride. With high quality brakes featuring rear and back hydraulic discs, users can safely and easily brake whenever needed. With a sturdy steel frame, the DB-34 combines lightweight and strength to create a powerful bike. The DB-34 is a newer release on Amazon and has no reviews accumulated thus far. The Razor Pocket Rocket Miniature Electric Bike is a compact dirt bike with the styling of a speedbike. With speeds achievable of up to 15 miles per hours, kids are guaranteed to have a blast on the Pocket Rocket. Dimensions of the pocket rocket electric bike measure 36 x 20 x 21 inches and the weight limit is 150 pounds, making it very sturdy for its size. With a variable speed and chain driven motor, users have just the right amount of speed for whatever type of ride. Featuring 10 inch pneumatic tires, the pocket rocket provides an easy ride through tough conditions. One of the biggest advantages that the Pocket Rocket provides is its 45 minute continuous use before needing a recharge. With a twist-grip throttle and hand operated rear brake, users have complete control of their Pocket Rocket. The Pocket Rocket has great standing on Amazon with over 150 reviews amassed. Those reviews contribute a 4.1 average star rating to the Pocket Rocket. The MM-B80 Youth Mini Bike is one of the fastest youth dirt bikes on the market, with an excitingly quick top speed of 23 miles per hour. With 2.5 horsepower capabilities, the MM-B80 never struggles to get up steep hills or to achieve top speed. Featuring adjustable handles, the MM-B80 is comfortable for all kids no matter the height or wingspan. With super gripping tires, the MM-B80 provides high quality control. With an automatic transmission, the MM-B80 is a smooth and easy drive that never gets boring. 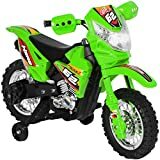 The MM-B80 is one of the most popular kid bikes online, with an average of 4 stars on Amazon through almost 150 reviews. This electric motocross bike is part of a line that Razor introduced based on the bike used by professional motocross biker Jeremy McGrath. By scaling down McGrath’s bike, Razor offers kids the ability to ride just like one of the biggest stars on the motocross stage. With motorcycle specified tires and specific tread between front and rear tires, the SX500 is ready to tear up any patch of dirt. Featuring dual suspension, the SX500 is as smooth a ride you will find on the children’s dirt bike market. With speeds achievable of 15 miles per hour, the SX500 provides a high speed experience for those looking for that. The SX500 also boasts 40 minutes of continued usage, giving kids more time on the dirt and less on the charger. The SX500 enables kids to have ultimate control of their bike through twist operated throttle acceleration and hand operated brakes for precision stopping power. The handles also feature soft grips, ensuring that long rides will not leave you with sore hands the day after. On top of this, the handles are adjustable by angle which gives kids of all heights and wingspans an easy adjustment for ultimate comfort. The retractable kickstand allows users to quickly and safely prop their bike up when they need to. The SX500 McGrath also sports a 16 inch front tire and 14 inch rear pneumatic tire for easy navigation through tough paths and trails. The shatter resistant plastic fairings ensure the durability of the SX500 McGrath, so you won’t have to worry about something always going wrong with your bike. With almost 100 Amazon reviews collected, the SX500 McGrath proudly stands with a 4.3 average star rating. The Razor Dirt Rocket is one of the highest performing dirt bikes for its class. With speeds achievable of up to 17 miles per hour, the MX500 is guaranteed to provide a rush of a ride. Powered by a 500 watt motor, users can take on the toughest trails and hills and scale them with ease. The MX500 sports a powerful battery that allows for up to 10 miles of travel before needing a recharge. Featuring knobby tires that size at 16 and 14 inches, the MX500 has maximum grip for better control and power. Equipped with dual suspension, the MX500 provides an excellent, smooth ride that won’t leave you sore afterwards. With adjustable handlebars, users can prepare their bike layout just as they like for the most comfort. One great thing about the MX500 is that its electric motor is much quieter than traditional gas motors, meaning you won’t get a headache from any loud clanging of your bike. When you’re done with the MX500 to need to hop off for a second, the retractable kickstand makes it simple and quick to do so. With the MX500 sporting a realistic dirt bike frame, kids are sure to ride in style. This bike is recommended for teen riders because of its great speed and power. 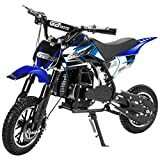 The Razor MX500 is one of the most popular dirt bikes purchased on Amazon, with an average star rating of 4.3 out of 5 through over 350 reviews. The Razor MX350 is a high quality dirtbike at a bargain price most appropriate or kids around 10 and up. Razor has a long standing history of being one of the best brands of scooters and bikes, so it is no surprise that their dirtbike are also popular. The MX350 Dirt Rocket is designed with a supercross-style body and is powered by a 250 watt electric motor. With that kind of power, the MX350 cranks up to 12 miles per hour which provides an adrenaline rush for users. With 30 minutes of continued use, the MX350 provides a lengthier dirt bike experience than standard electric ones. With 12 inch pneumatic tires, the Dirt Rocket doesn’t struggle through divots or loose terrain. The MX350 is commonly praised for its performance, and it fact it one received recognition in an edition of Sports Illustrated for Kids. Equipped with dual suspension, the MX350 is a smooth, comfortable ride that won’t leave you sore the next day. With adjustable handlebars, kids of different heights and wingspans can gear their bars to however they prefer to gain maximum control. With the hand operated rear brake, kids can stop on a dime if needed. With a chain driven motor and high torque production, the MX350 is guaranteed to bring kids an exhilarating while they throw up dirt. The MX350 is incredibly popular among Amazon buyers, with an astounding average star review of 4.3 out of 5. The TAO SPORT MX-350 is sharp looking bike that performs just at a level that matches its looks. The MX-350 features a 24 Volt motor and 350 watts, giving it a great amount of power for ultimate fun. With knobby all-terrain tires on 10 inch alloy wheels, the MX-350 has the ability for stable control on the craziest hills and turns. With hydraulic disc brakes, users can stop on a dime whenever they need, making the MX-350 an all-around safer bike. With a max speed of 15 miles per hour, the MX-350 zips across the ground with force. With a chain drive transmission and electric motor, users don’t have to worry about the noise and mess of traditional gas-powered engines. The MX-350 just recently released on Amazon and has not received any reviews yet. As one of the cheapest dirt bike options on the market, the EM-1000 is a great starter bike for kids wanting to get into the dirt bike scene. With dimensions of 36 x 21.5 x. 9.8 inches, the Em-100 is best used for kids 8 and older, and the weight limit for this particular bike is 120 pounds. Featuring 100 watts of power, the EM-100 clocks in a top speed of 10 miles per hour, making a safe but nonetheless fun dirt bike. With a 24-volt rechargeable battery, users can enjoy up to 40 minutes of continuous ride. The EM-100 sports Instant Throttle Response, providing quick acceleration upon the twist of a handle. Riders can stop on a dime with the hand brake which activates the rear drum brake. With puncture proof knobby tires, the EM-100 handles tough rides and keeps you on the move. With a chain drive power system, the EM-100 is a smooth and enjoyable experience. At a very affordable price, the Pulse Performance EM-100 is a great value because of its performance and style. With a nearly perfect average star rating of 4.8, the EM-100 is one of the highest rated on the market. The Vroom Rider VR093 is a great, affordable dirt bike option for younger kids. With dimensions of 42.1 x 20.9 x 27.6 inches and weight capacity of 55 pounds, the VR093 is geared to be a younger kids introductory and learning bike. Although this bike is geared for 3 to 5 year old kids, the VR093 still boasts some great features that make it an awesome bike. With forward and reverse controlling which are interchangeable with the flip of a switch, the VR093 gives kids the ability to maneuver as they need. With a max speed of 2 miles per hour, the VR093 combines safety and enjoyability for kids. One feature that the kids will certainly love are the lights and sounds. The sound button plays back fun music and the bike actually has working headlights. With a 6 volt battery, the bike is ready to go after a good overnight charge. With a right grip throttle, the VR093 gives kids the authentic dirt bike feeling. The VR093 has average to good reviews on Amazon with an average star rating of 3.1. It is important to note this bike is really primed for younger children. 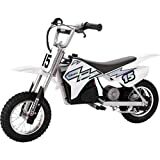 The A-Z Goods Battery Operated Dirt Bike is a very affordable dirt bike for kids wanting to begin riding dirt bikes. With a max speed of 2 miles per hour, the A-Z Goods Dirt Bike combines an enjoyable dirt bike ride with a safe dirt bike ride. With both forward and backward movement, the A-Z Goods Bike gives users the control they need to efficiently navigate trails and off road paths. The A-Z Goods Bike is exciting with its music and light features. At the touch of a button, kids can listen to the bike’s fun music and switch on the working headlights for navigation in the dark. With a body size of 42.13 x 20.86 x 27.56 and weight limit of 55 lbs, the A-Z Goods Bike is best used for kids ages 3 to 5. The bike is powered by a 6 volt battery and takes a 8-12 hour time to fully charge. For kids wanting to learn the feel of dirt bikes and look like a pro doing it, the A-Z Goods bike is the way to go.